If you weren’t excited for UFC Brooklyn, you should be after today’s heated press conference. 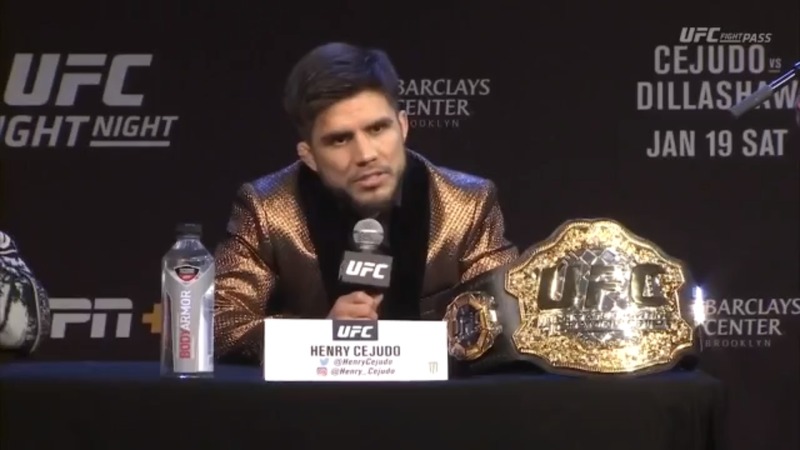 Flyweight champion Henry Cejudo and bantamweight champion TJ Dillashaw, along with lightweights Donald “Cowboy” Cerrone and Alexander Hernandez, exchanged words at The Music Hall of Williamsburg. The cozy confines of the venue added to the experience as fans and media eagerly listened to the four fighters talk trash with one another. It started with Cejudo pulling out his Olympic gold medal and telling Dillashaw to come and take it, with Dillashaw laughing throughout the entire gesture. Dillashaw also prompted the audience to count the number of times that Cejudo referenced his medal and spoke about himself in third person. But the biggest take away from the championship exchange was what is motivating each of these title holders. 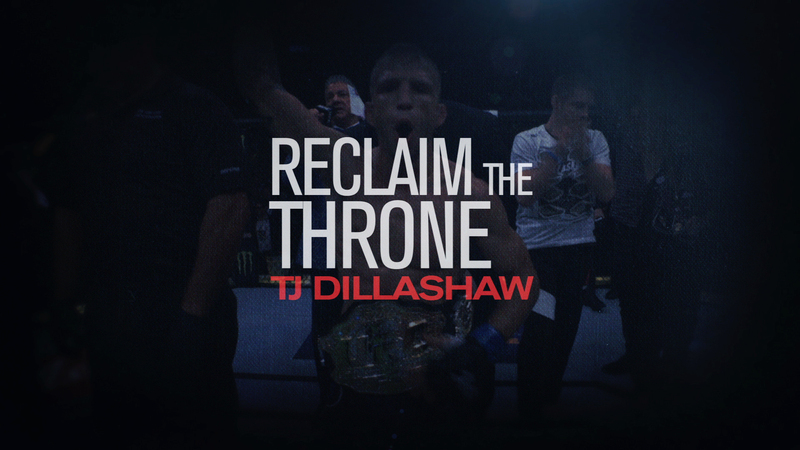 Dillashaw’s reasoning for accepting this fight couldn’t be more different. The trash talk really turned up once the No. 11-ranked Hernandez started challenging Cowboy to a war of words. “I just see myself facing an insecure little lad, swinging on a saddle with a pop gun and feather in his hat,” Hernandez said. He would go on to inform Cowboy that he looked “aged and withered”. The response from the UFC’s all-time leader in finishes was simple. The banter and quips between Hernandez and Cowboy continued during their intense face off, with the two never breaking eye contact. Before the two champions met at center stage, Cejudo brought out a prop snake and slammed it directly in front of Dillashaw. Then the two faced-off, with both showing fire. Given that all four of these fighters make weight, fight fans should be in store for two incredible showdowns. 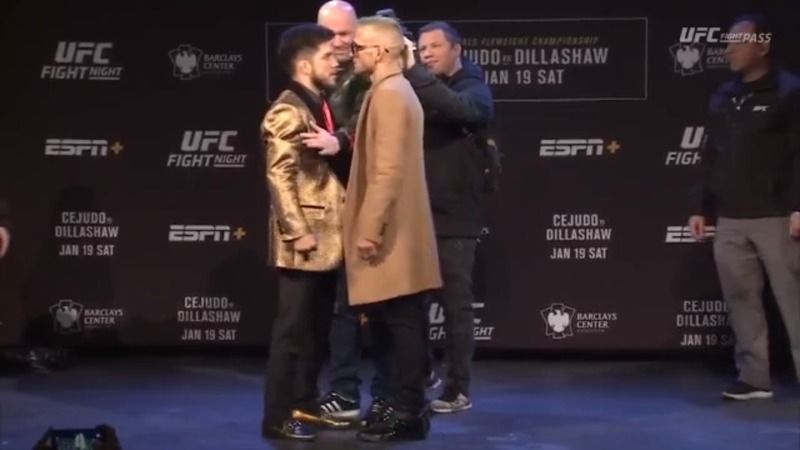 Make sure you tune into ESPN+ at 10pm/7pm ETPT to watch the main event between Cejudo and Dillashaw. Also head to ESPN at 8pm/5pm ETPT to catch Hernandez fight Cowboy. If you don’t know how to watch the UFC on ESPN, check out how to watch here. Gavin Porter is a digital producer and writer for UFC.com, follow him on Twitter @PorterUFCNews.